There's been plenty of talk about the Apple Watch's battery, which lasts about a day on a full charge. Some consider that a weakness, and it's one that Asus may intend to exploit. 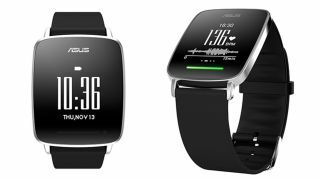 The Asus ZenWatch is not the most advanced or glamorous smartwatch, and it's certainly no true Apple Watch rival, but the next Asus smartwatch could be a different story. Apparently called the Asus VivoWatch, it will pack a 10-day battery life, reports Engadget. The Asus VivoWatch will be fitness-focused, the site says, and it could have other bells and whistles like sleep and heart rate tracking and GPS. But its true selling point will be that extra long life, a direct counter to the Apple Watch's perceived weakness. It might achieve that significant battery life with an efficient black and white display/colored LED light combo, which you can see in the picture above. It also might not use Android Wear. We're expecting to learn more - possibly including the Asus VivoWatch's price - this week, so stay tuned.